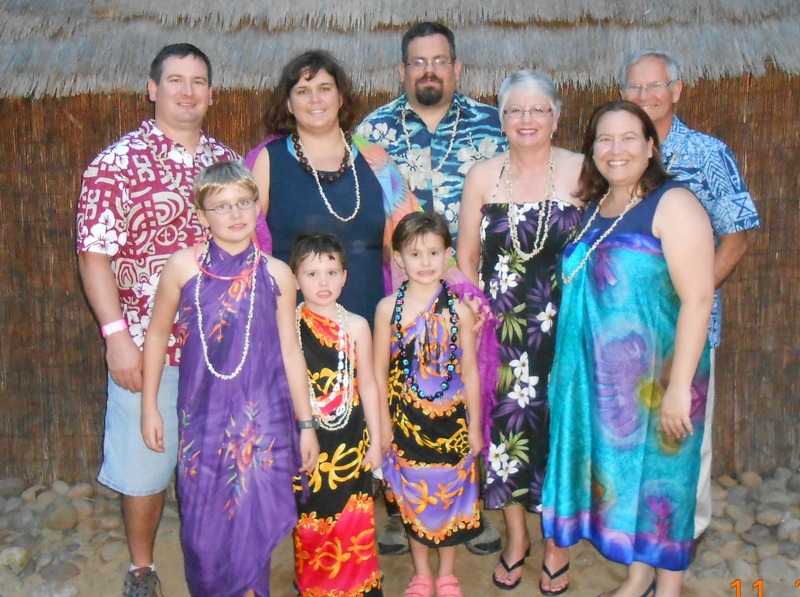 When we decided to take the entire family on a cruise to Hawaii to celebrate our fortieth wedding anniversary, we didn’t realize just how much fun it would be. We did so much I’m not sure how to tell the story, but here goes. . . . .
After months of planning (we began to plan for this in April), Pat and I arrived in Honolulu on Nov 21st, and our daughter, Elisabeth arrived later that same afternoon. We stayed at the Hale Koa Hotel near Waikiki. The next morning we were up early (Our bodies were still on Eastern Time) and headed to Diamond Head. 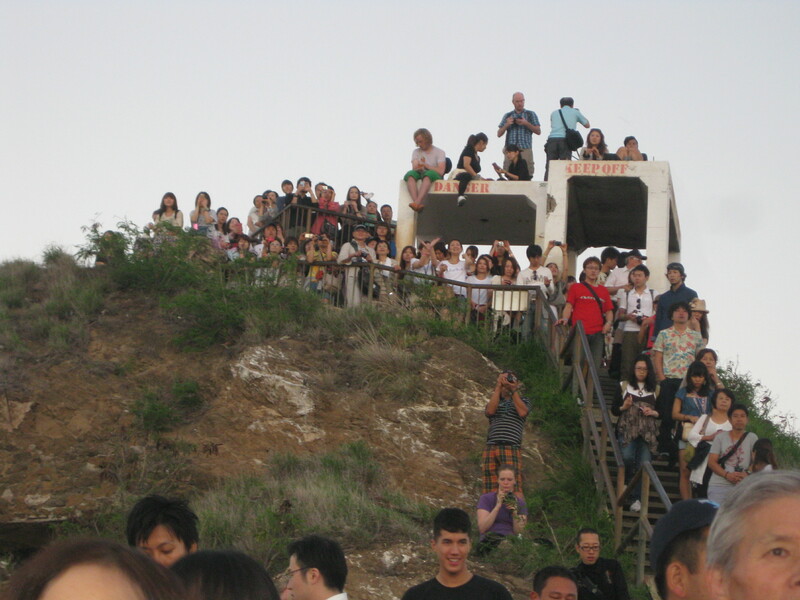 We were surprised by the size of the crowd, the last time we were in Hawaii there were only a dozen or so people at Diamond Head. This time there was a solid line of people all the way to the summit. We climbed to the top to watch the sunrise. It was quite a climb, but the view was worth every step. 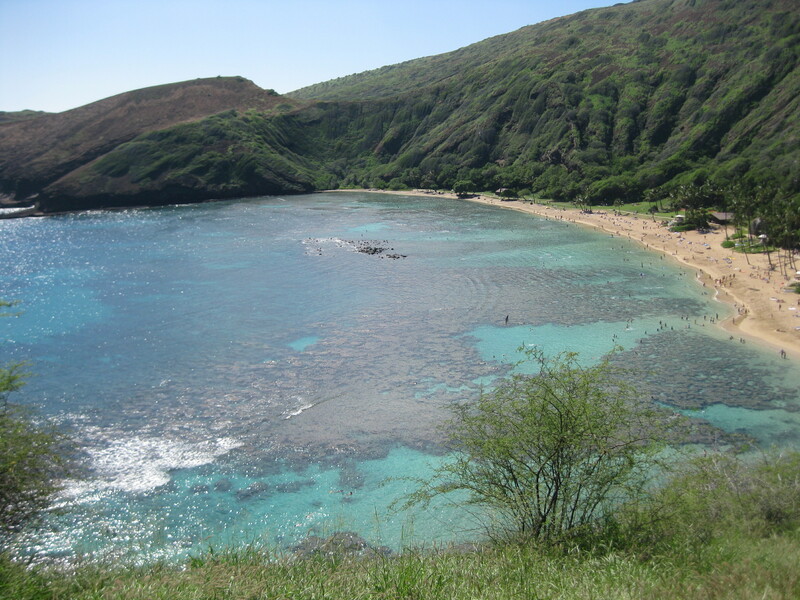 From there we drove to Hanauma Bay where Elisabeth and I dove while Pat snorkeled above us. 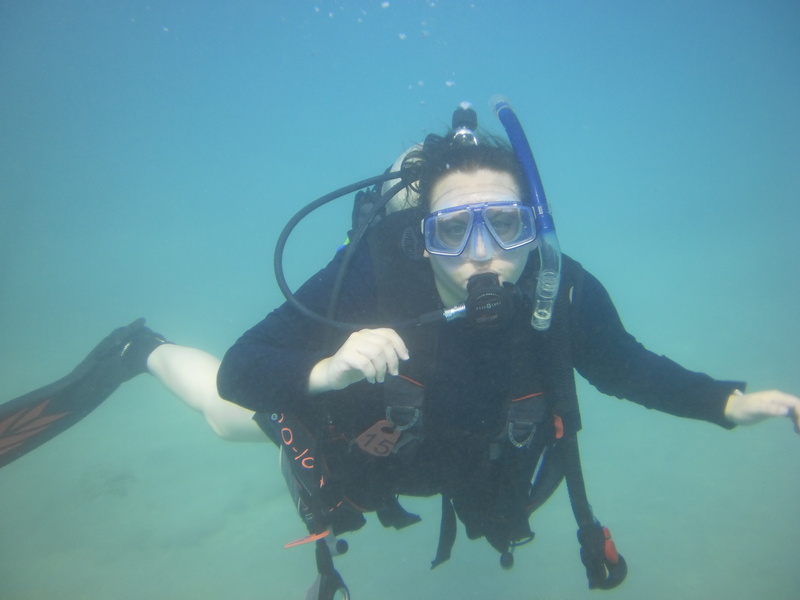 It was Elisabeth’s first dive in the ocean and she loved every minute of it. That evening we picked up our son, Dave and our oldest son, Scott, his wife, Sandra, their daughters, Katrina, and twins, Clarissa, and Sierra. We were relieved that no one had problems with their flight arrangements. The next morning was another early one as we drove to Pearl Harbor to visit the USS Arizona Memorial. 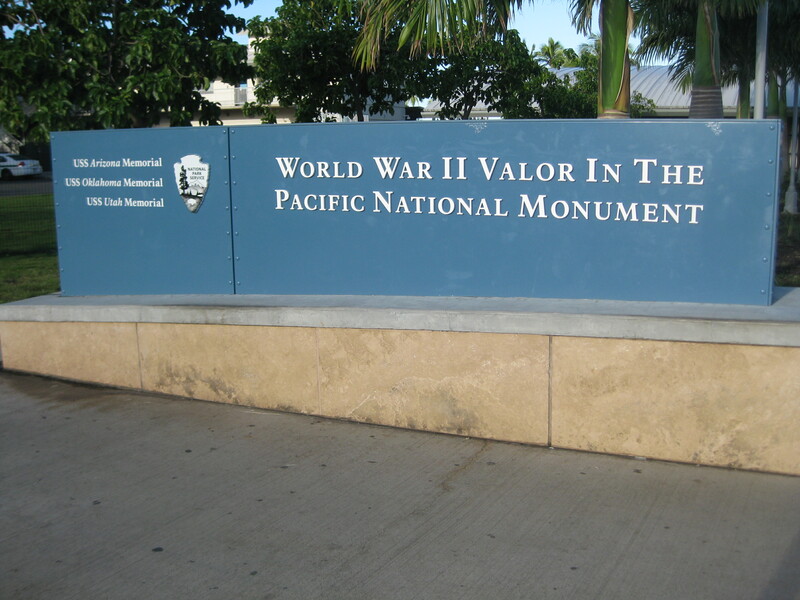 The Pearl Harbor Visitor Center is the primary portal for visitors coming to Pearl Harbor, and has the WWII Valor in the Pacific display. The display tracks America’s lead up and entry into the war. We took the ferry to the USS Arizona Memorial. The memorial was erected over the sunken battleship and you can see the ship from the surface. 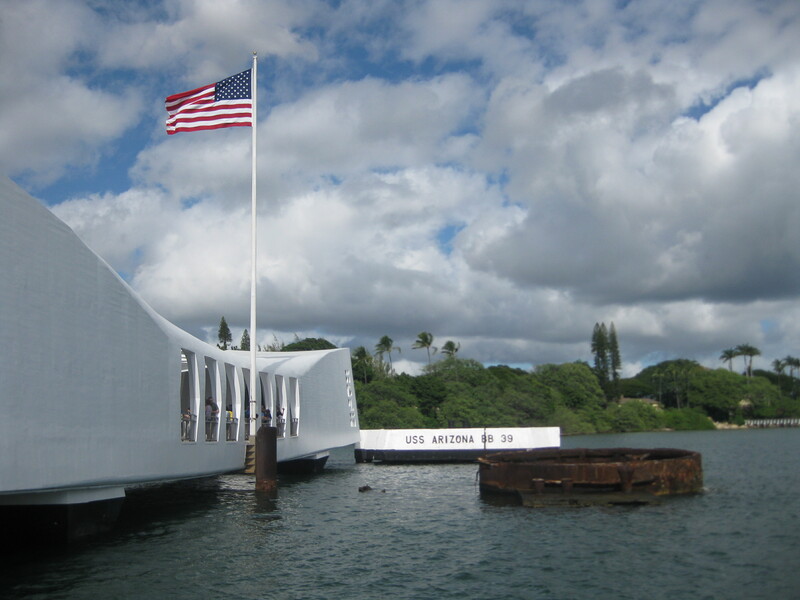 The memorial is like the headstone of the tomb for the 1,177 sailors and marines that died on Dec 7, 1941. Visitors are cautioned to act accordingly and we were proud of the respect our granddaughters showed while on the memorial. The Number Three Turret ring is the only part of the ship above the surface of the harbor. Survivors of the Arizona have the opportunity to have their remains interned in the Number Three Turret so they can rejoin their comrades. The oil still that seeps from the fuel bunkers of the Arizona is said to be the ship crying for her lost crewmen. 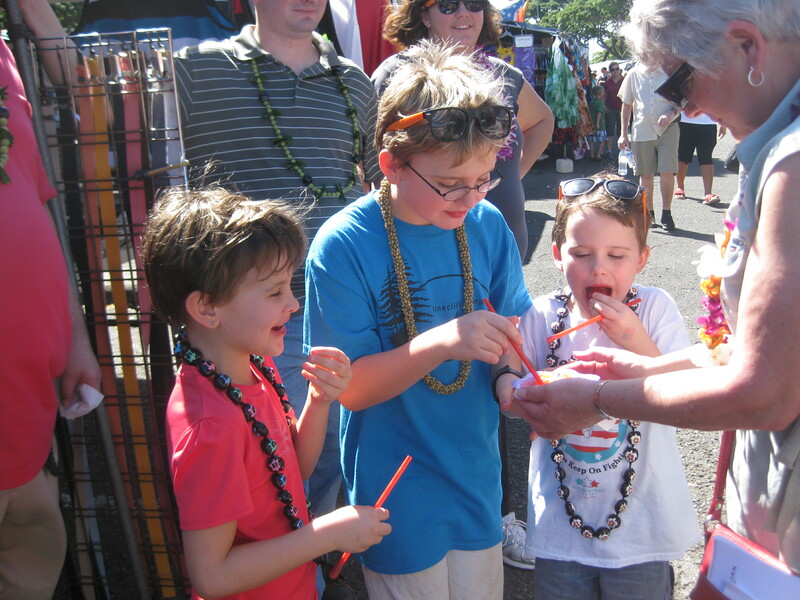 That afternoon we shopped at the Swap Meet at the Aloha Stadium. Since 1979, the Aloha Stadium Swap Meet has become Hawaii’s premier outdoor market, featuring over 400 vendors, crafters, artists from all over the world, a true melting pot of Aloha. It was a unique experience resulting in purchases of leis and aloha shirts. The girls loved it! Now on to the cruise! 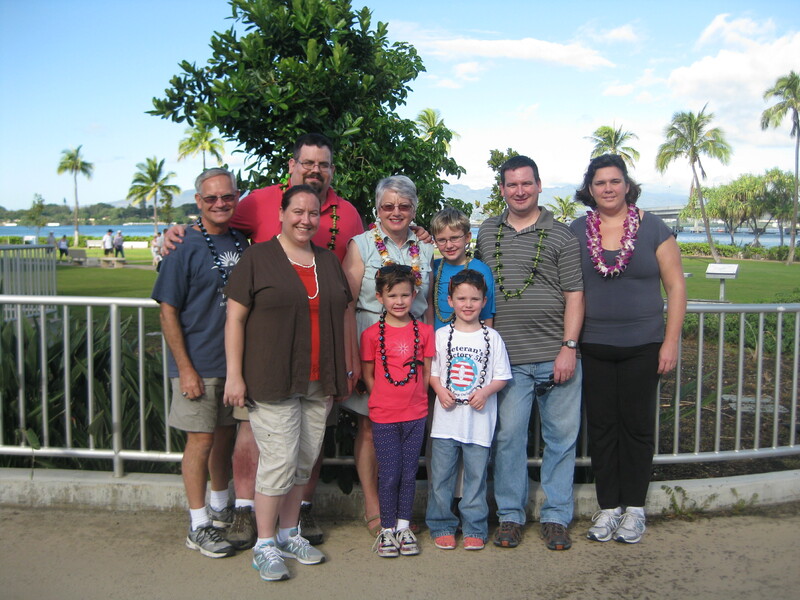 We boarded our ship, the Pride of America in Honolulu and our first port of call was Maui. 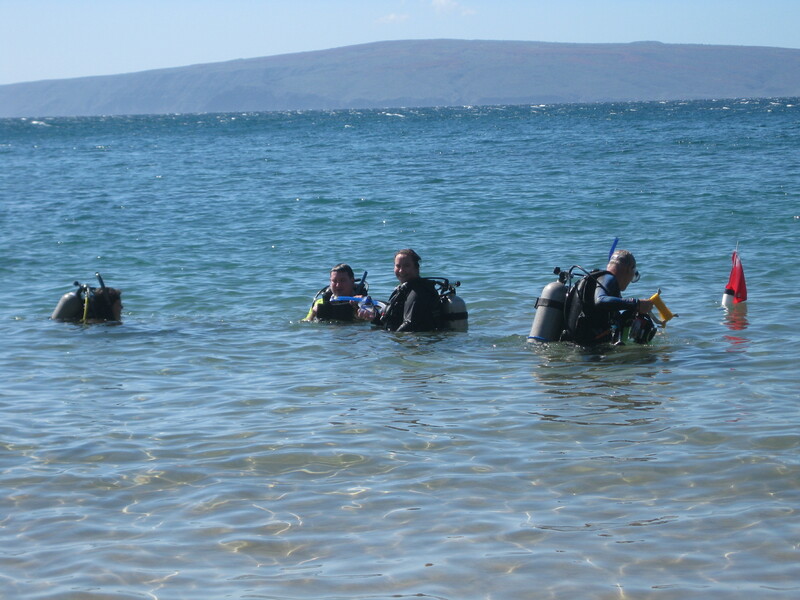 First item on the agenda was SCUBA diving and snorkeling at Makena Landing on the west shore of the island. We stopped at a dive shop on our way there to rent tanks and equipment, and get a briefing on the dive location. 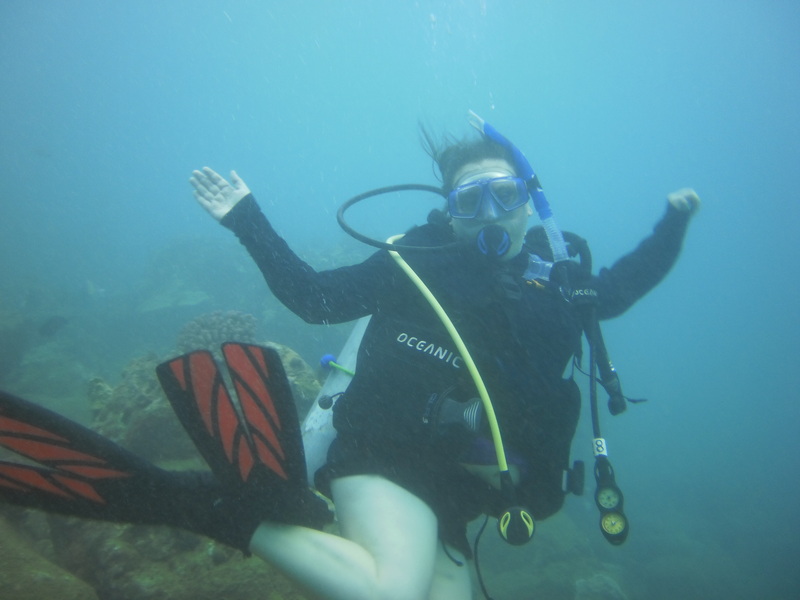 The diving was great and we saw all kinds of fish as soon as we were underwater, and turtles soon after that. The reef offered some walls and underwater caves to explore. We had a great time! Dave and Pat snorkeled with the girls while the rest of us were underwater and when they weren’t in the water, they were playing in the sand and the rocks. After a lunch on the beach, Scott, Sandra, and I did a second dive. 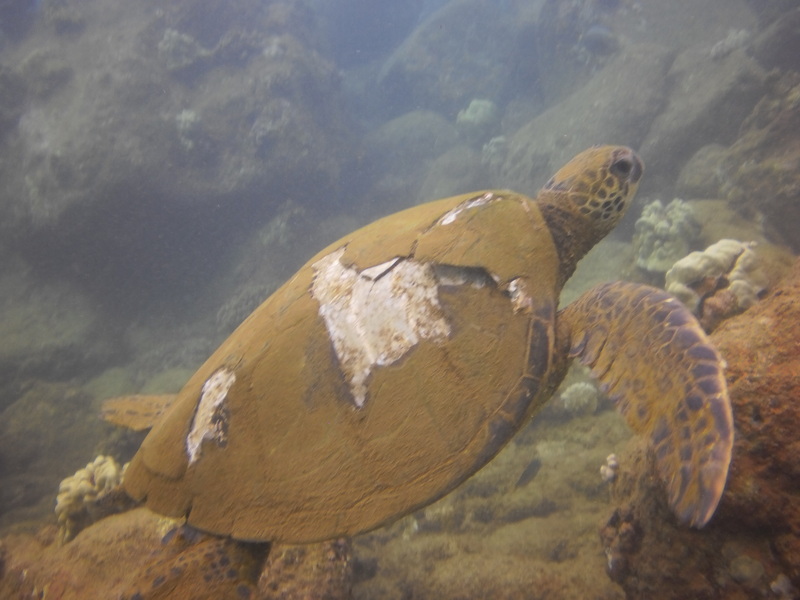 The highlight of that dive was when a turtle descended right in front of us and just sat there. It was so close we could have reached out and touched it (but that is a big “No-No!”). 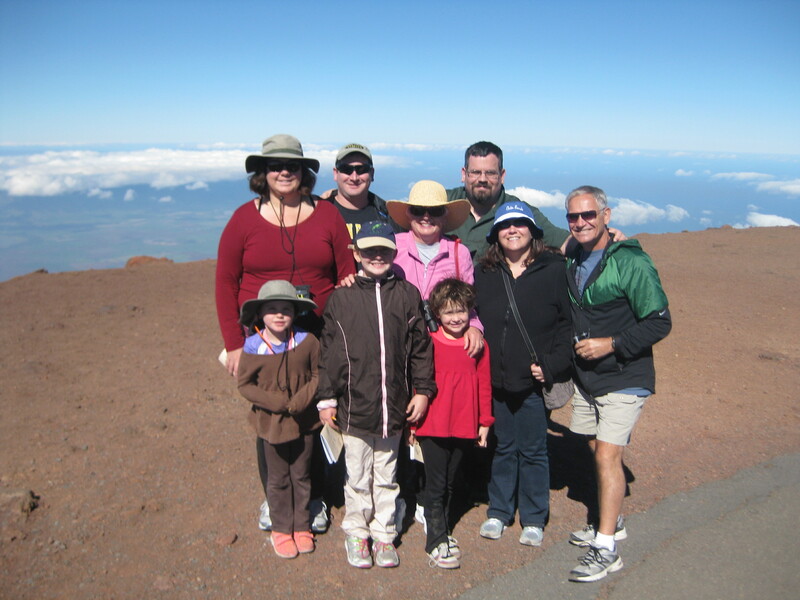 The next morning we went to Haleakala Crater, its rim is the highest point on the island, more than 9,000 feet above sea level. Even though we were in Hawaii, it was cold. We lucked out on the clouds. When Pat and I were here years ago, the clouds surrounded the summit and all you could see were clouds. On this day we could see almost the entire island. We had fun pointing out the cruise ship, Makena Lansing, and other spots. The girls had picked up their Junior Ranger booklets at the Visitor Center and were energetically working their way through them. 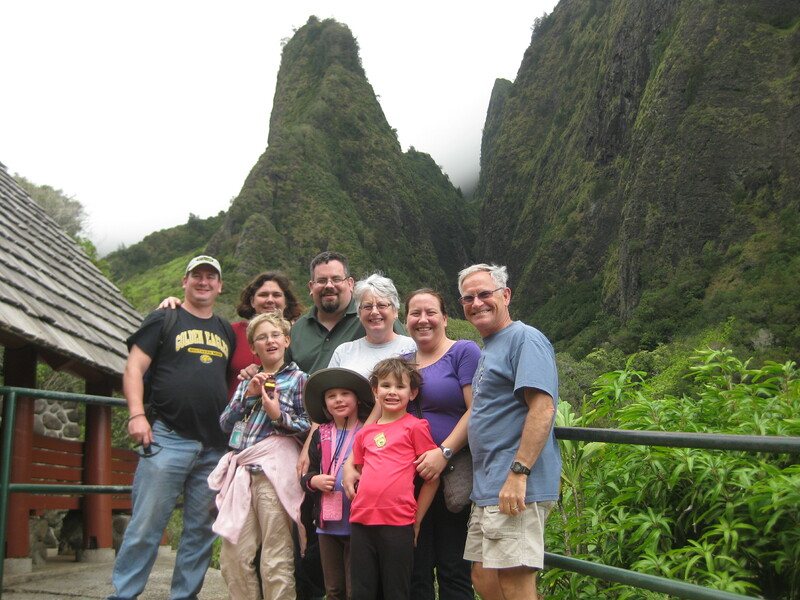 We descended from Haleakala and took the back roads to the Iao Valley. 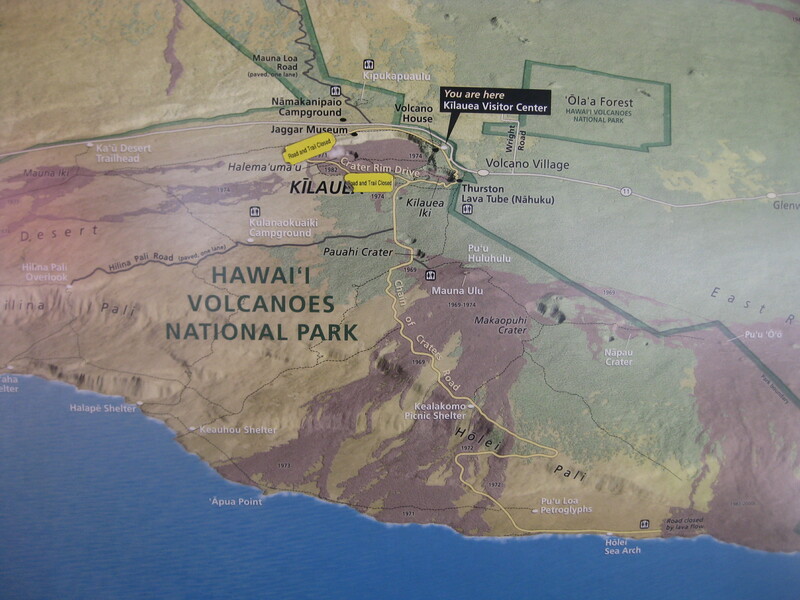 This state park is the site of battles that took place in 1795 when King Kamehameha invaded to conquer Maui and the other islands to create a unified Kingdom of Hawaii. 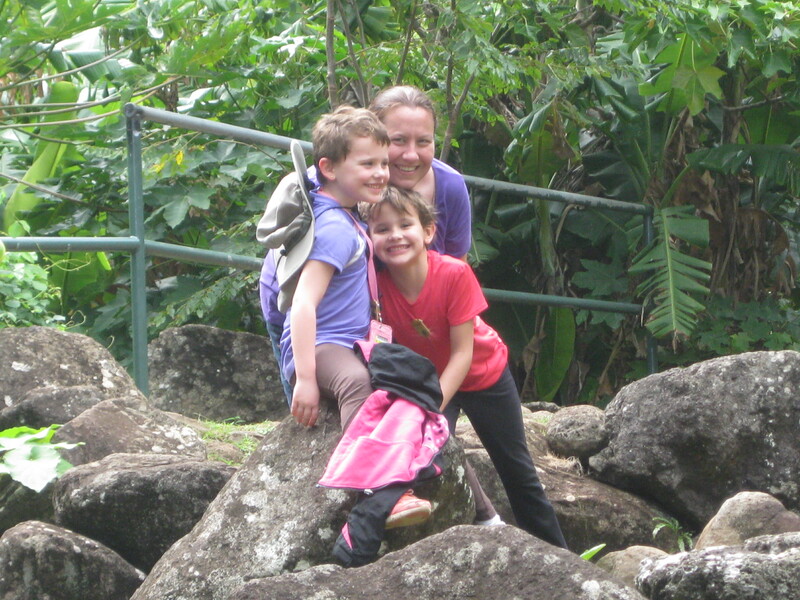 The Iao Valley is the most lush place we saw on Maui. It is covered in dense rainforest, most of which consists of introduced vegetation on the valley floor. 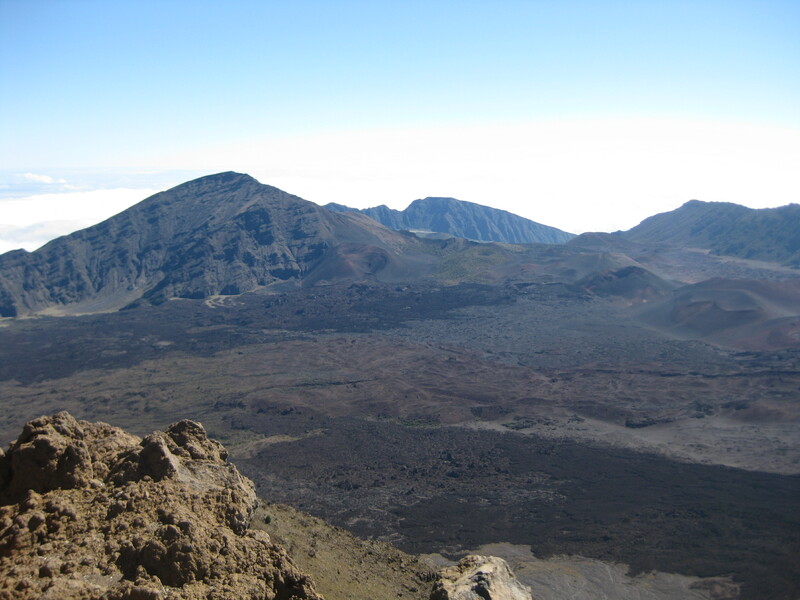 The Puʻu Kukui summit area at the valley’s head receives an average 386 inches of rainfall per year. That night Elisabeth, Pat and I attended a performance of “Oh What a Night,” a tribute to Frankie Valli & The Four Seasons. The performers stayed true to the original recordings without trying to mimic or impersonate the group. Their interpretation of these classic hits are so true to the original recordings that it is pointed out that the cast is singing live and not lip-syncing. It was a great show! 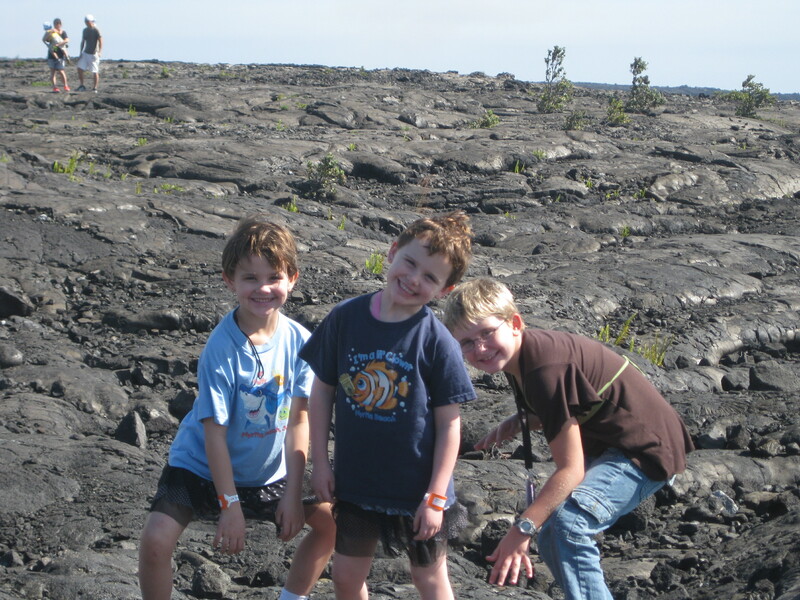 Hilo, on the big island of Hawaii, was our next port of call and we drove to visit Volcanoes National Park. 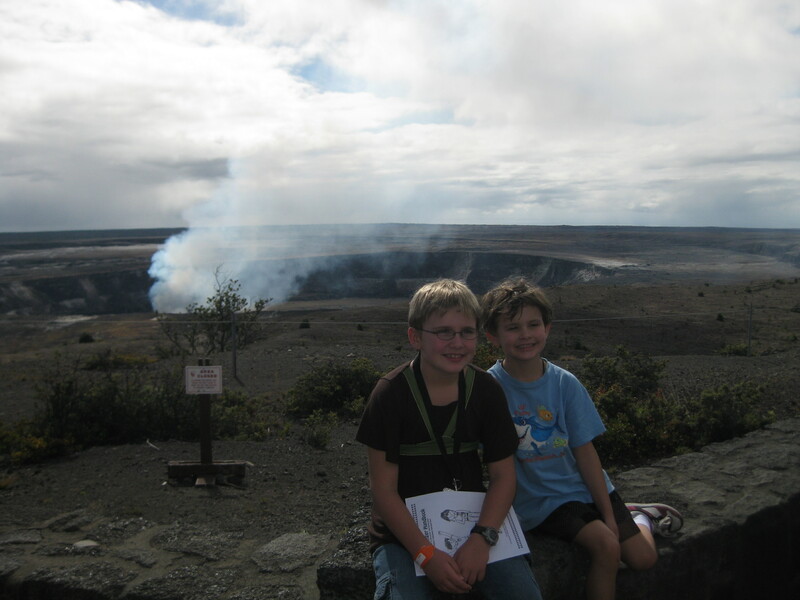 At the Kīlauea Visitor Center we looked at displays, viewed videos, and picked up Junior Ranger booklets. Due to airborne ash from the volcano it was not possible to drive around the volcano’s caldera, but it was still possible to get to the Thomas A. Jaggar Museum. The Jaggar Museum is built on the edge of Kīlauea Caldera and we had spectacular views of the caldera and the main crater Halema’uma’u from this view point. Nearby we were able to see steam vents where the water that has seeped down through cracks in the earth is turned into steam by the superhot lava and is exhausted back to the surface. 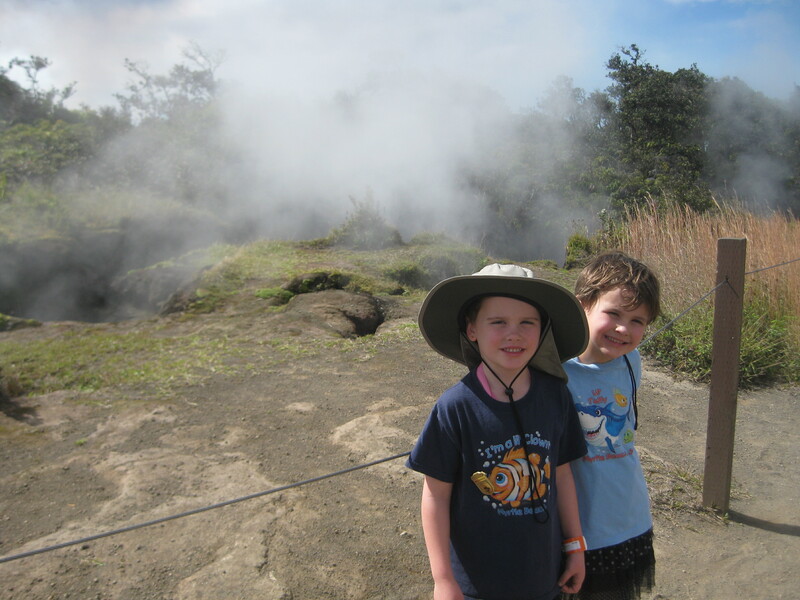 What is a visit to Volcanoes National Park without driving out to the lava flows? We drove along Chain of Craters Road and looked down into the Kīlauea Iki crater. A little further on we came to the Devastation Trail. 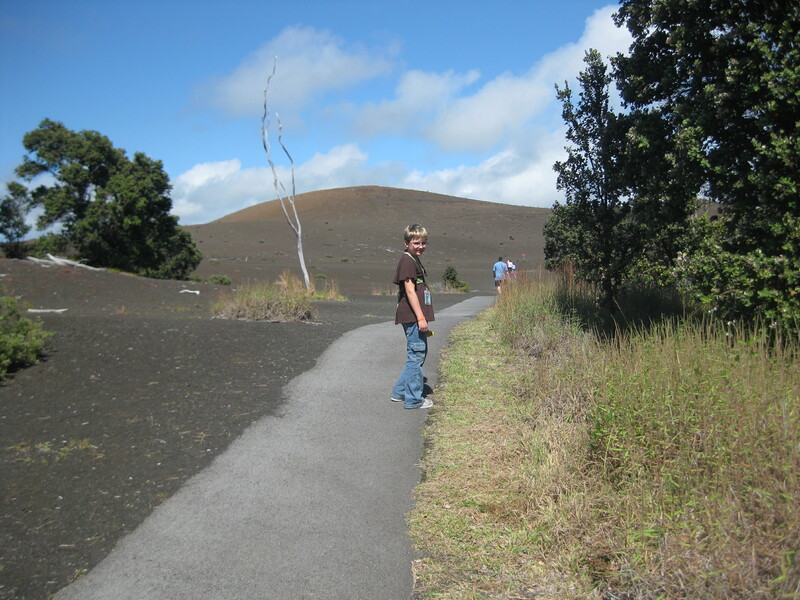 This trail is a paved path through a forested area that was devastated by falling cinder from the spectacular lava fountains of the 1959 Kīlauea lki eruption. 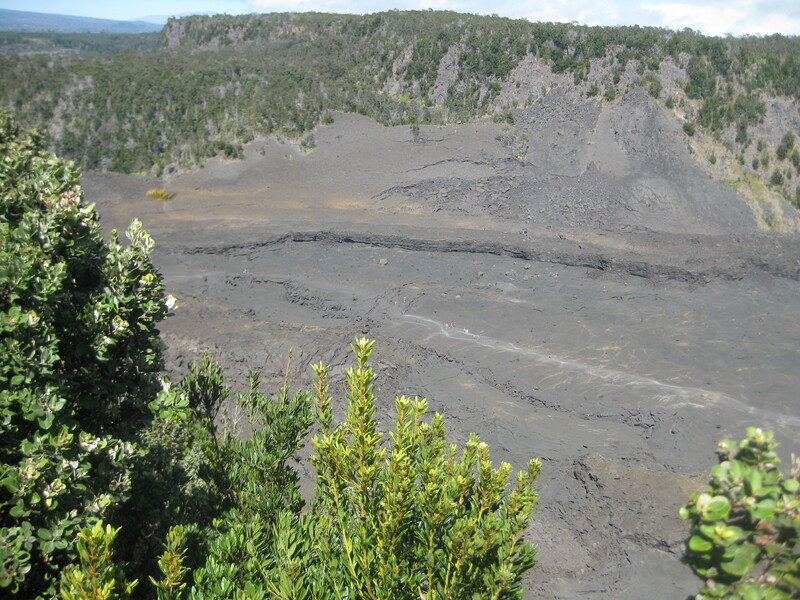 It was interesting to note the vegetation that was returning to the area, growing through the volcanic ash. A lava tube is a natural conduit formed by flowing lava which moves beneath the hardened surface of a lava flow. Tubes can be actively draining lava from a volcano during an eruption, or can be extinct, meaning the lava flow has ceased and the rock has cooled and left a long, cave-like channel. 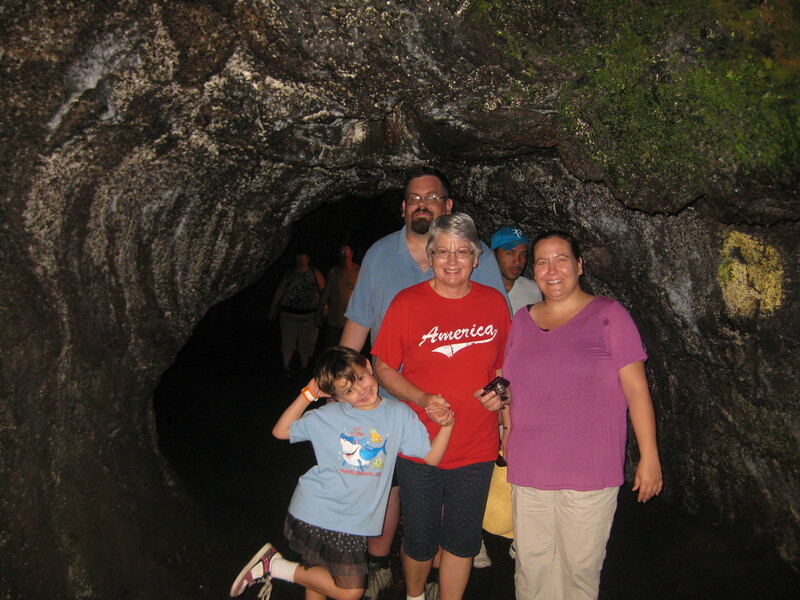 The Thurston Lava Tube, along Chain of Craters Road is an example of this. The contrast of the lava tube with the rain forest overhead was striking. We drove as far as we could in the time we had left down Chain of Craters Road through the East Riff Zone. 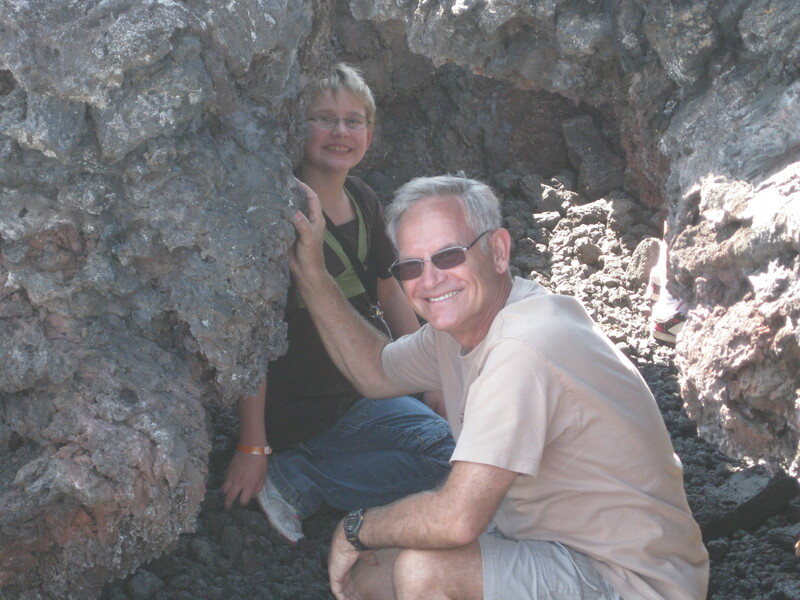 We stopped to climb over the remains of earlier lava flows, some smooth and some jagged, and had a late lunch at a site overlooking where the lava flows went all the way to the shore. Back at the Visitor Center the girls turned in their booklets and were given their Junior Ranger badges. 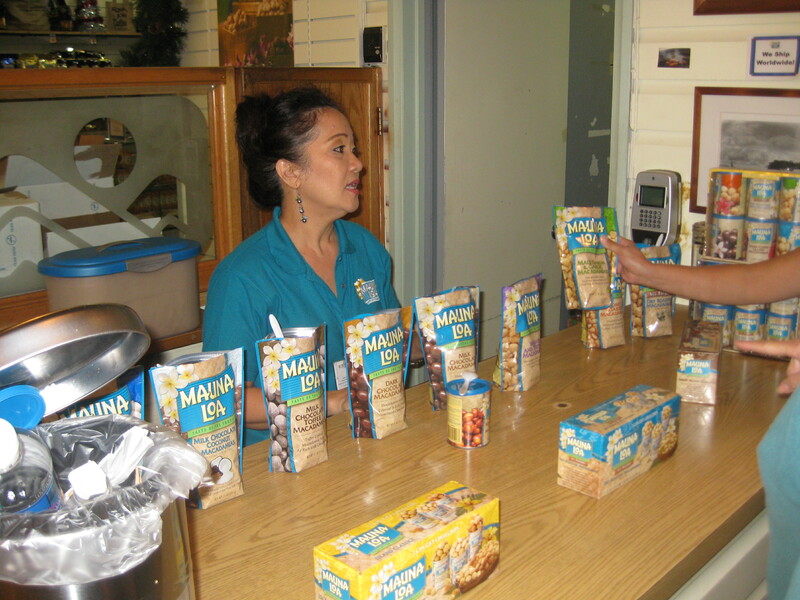 One of Elisabeth’s requests was to visit the Macadamia Nut Factory in Hilo. We were able to make that our final stop on the way back to the ship. I love a place that gives you free samples to taste before you decide to buy! The next morning we were anchored in the harbor of Kona. Kona was originally a small fishing village and was never developed into a large port. Consequently it does not have the facilities for large cruise ships to dock at a pier. We “tendered” ashore using small boats from the ship to ferry us from the ship to the dock and back again. 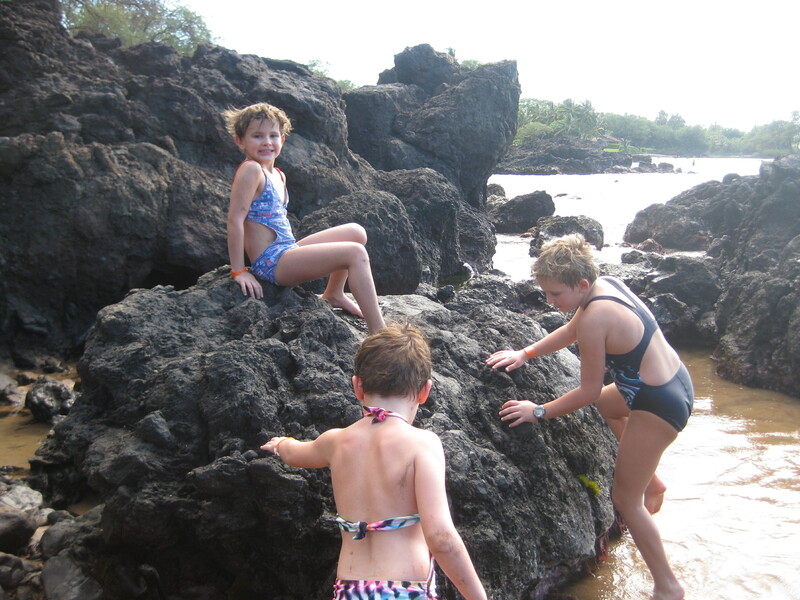 Kona was planned as a relaxing stop (compared to our other stops) and we just snorkeled at a beach next to the dock. It was a nice beach to play and relax. The snorkeling was terrific. We were able to snorkel quite a distance from the beach and the crowds, yet still be safe from boat traffic. The water was tap water clear and the fish were colorful and abundant. All of us enjoyed it. 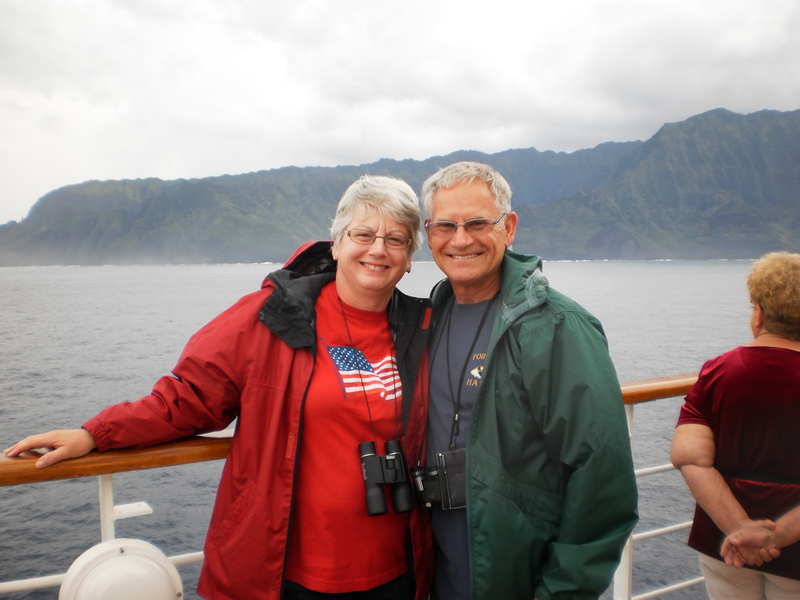 The next morning we docked in our final port of call, the garden island of Kauai. 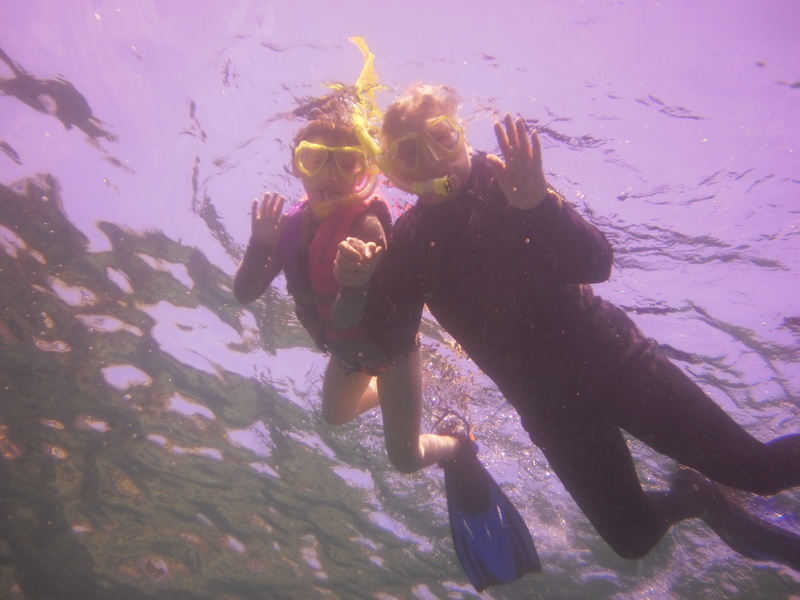 We had originally planned to dive and snorkel on our first day in port, but had forgotten that that day was Thanksgiving! 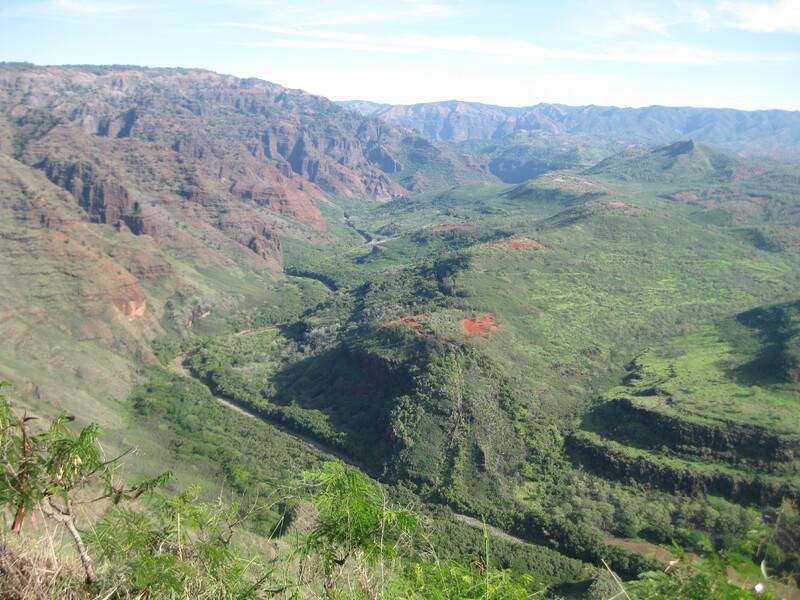 Instead we drove up to Waimea Canyon, the Grand Canyon of the Pacific. What great views we had! We stopped several times along the way at overlooks to see the canyon floor and take pictures. 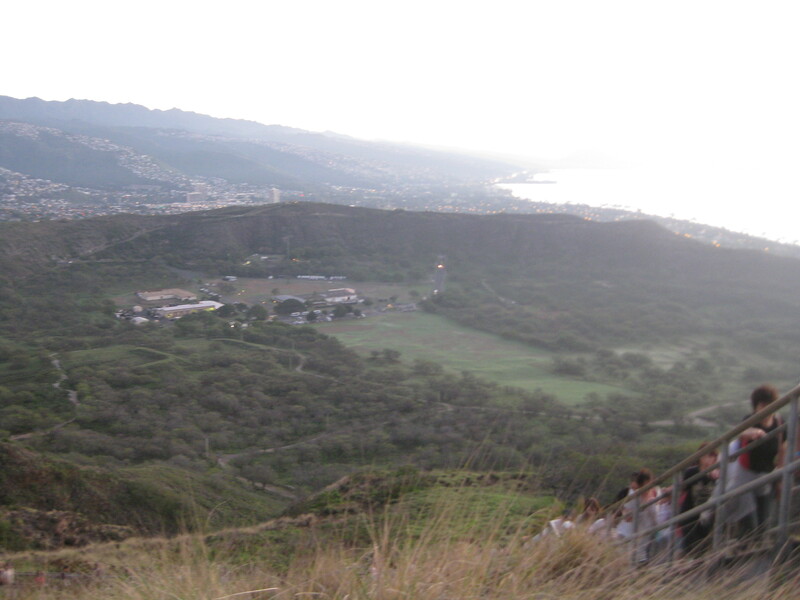 When we got to Wai’Ale’Ale, the highest point on the canyon at 5,148 feet, we could see all the way to the Na Pali coast! We celebrated Thanksgiving in the Skyline Dining Room onboard ship. 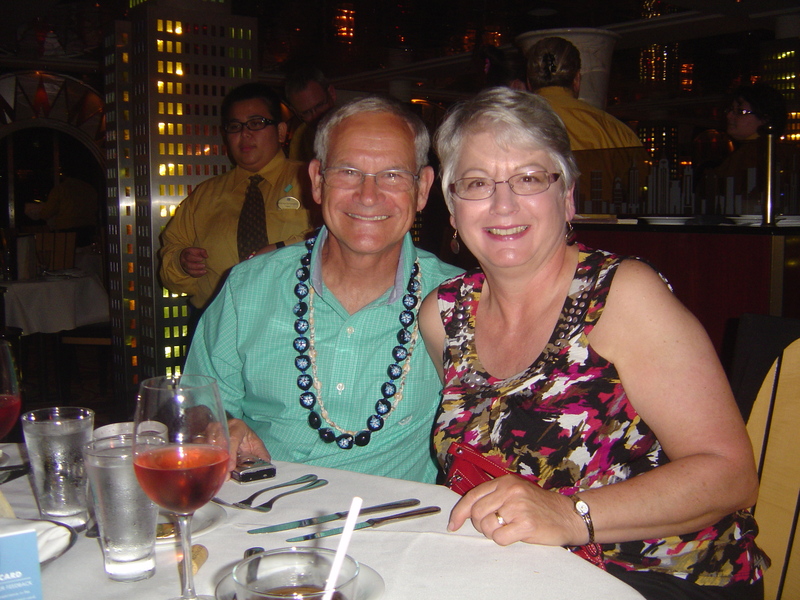 It was nice to be together for dinner with everyone as we toasted our fortieth wedding anniversary. The girls (ages 6 and 9) were very proper and it was fun to watch them order their own meals. I think they really enjoyed dining as adults with waiters delivering their meals. I hope this trip hasn’t spoiled them for when they return home to Salt Lake. The next day was a short one, as we had to be back onboard ship for a two o’clock departure. 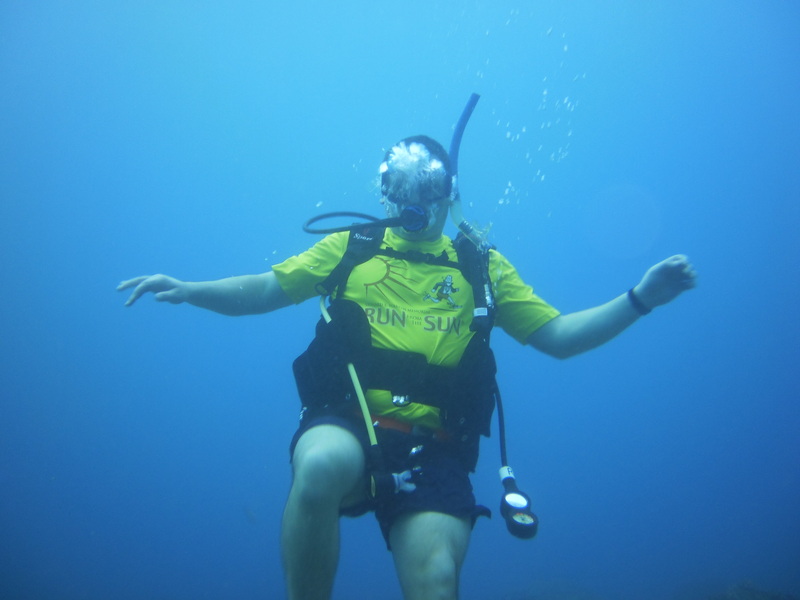 We drove to Seasport Divers, a dive shop in Koloa Town. 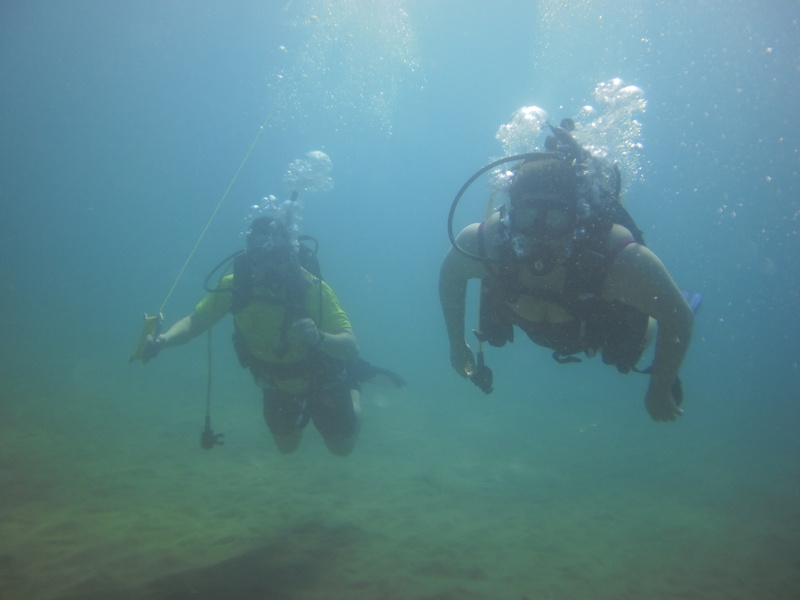 There we rented SCUBA equipment and got an orientation on the dive site we had selected. 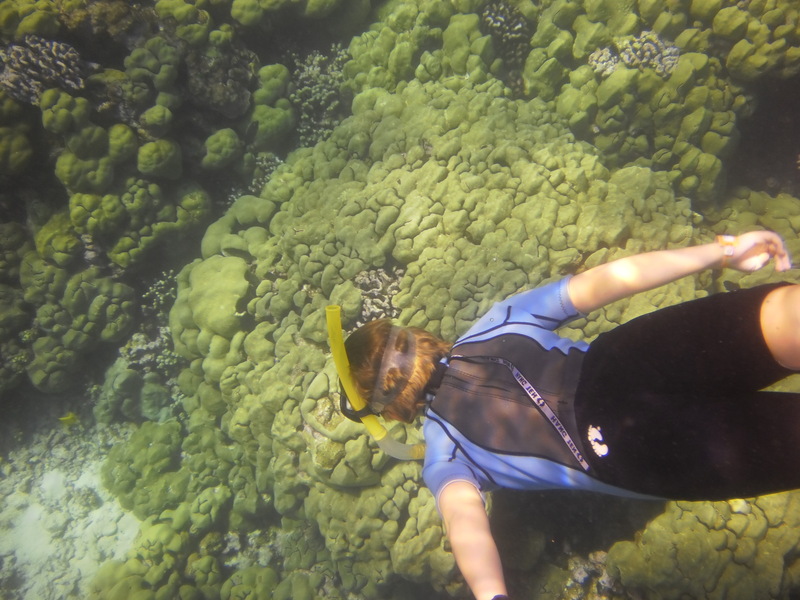 This site wasn’t very good for snorkeling and we got directions to a nearby beach for the snorkelers. Koloa Landing is a very popular dive location with many instructional classes diving that morning, making it quite crowded. However, once we were in the water, it didn’t feel crowded at all. The surf was stronger than we had experienced on earlier dives, but Scott, Sandra, and Elisabeth handled it well. 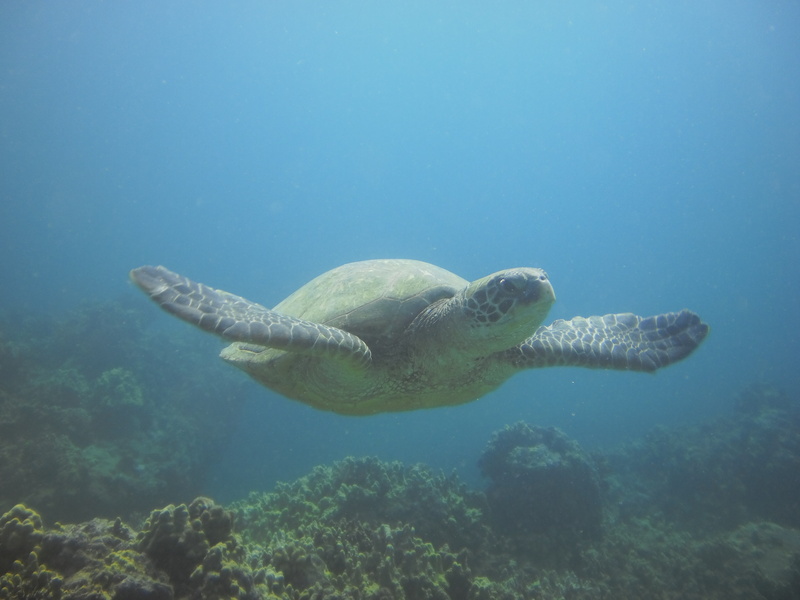 The underwater rock and coral formations were terrific and abundant fish to see as well as a Green Sea turtle that had had an accident with a propeller. Our last stop on Kauai was the Spouting Horn blowhole. This is one of the most photographed spots on Kauai. This natural wonder occurs when water rushes under a lava shelf and bursts through a small opening at the surface. Every wave produces another spray. 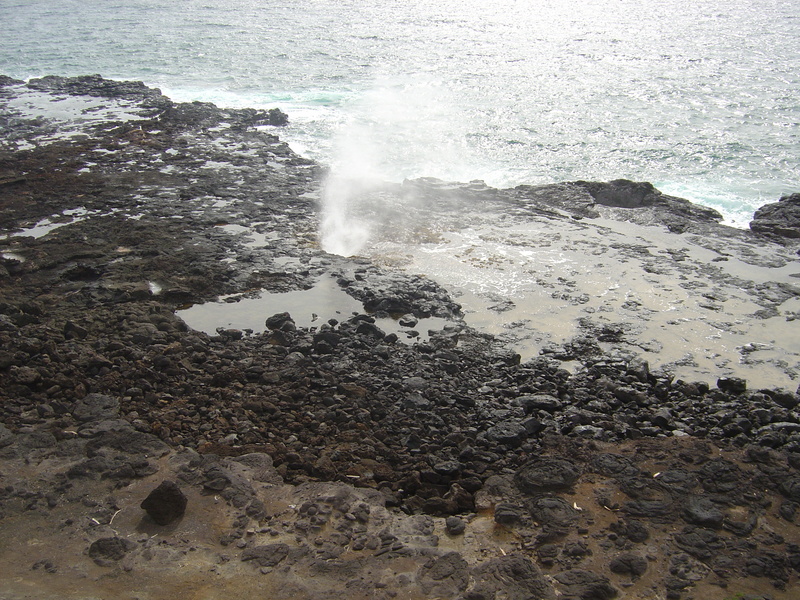 Spouting Horn frequently spurts salt water 50 feet into the air. 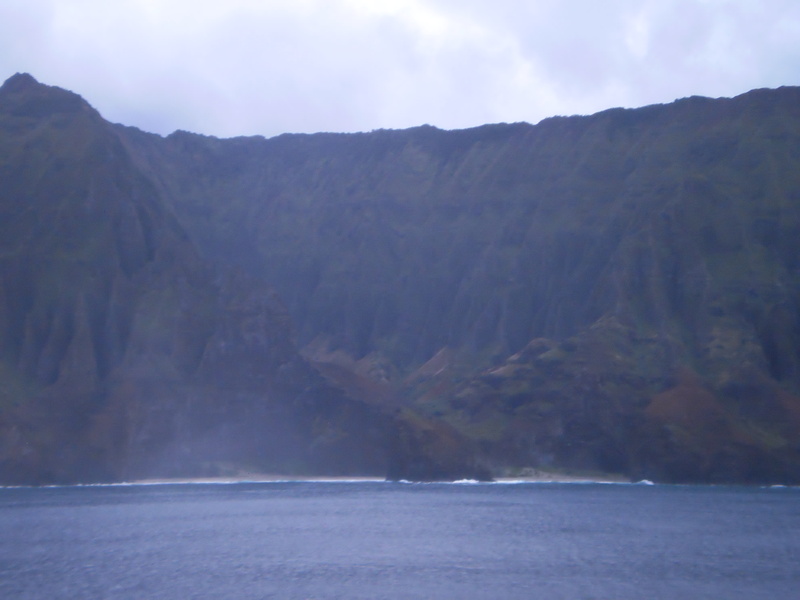 We departed the port of Nawiliwili and the ship’s route took us along the Na Pali Coast. The pali, or cliffs, are a rugged landscape of deep, narrow valleys ending abruptly at the sea. Waterfalls and swift flowing streams continue to cut these narrow valleys while the sea carves cliffs at their mouths. Extensive stone walled terraces can still be found on the valley bottoms where Hawaiians once lived and cultivated taro. The Na Pali Coast is only accessible on foot or from the sea and this route allowed us to view this spectacular coastline. After dinner that night we attended the final show on board. 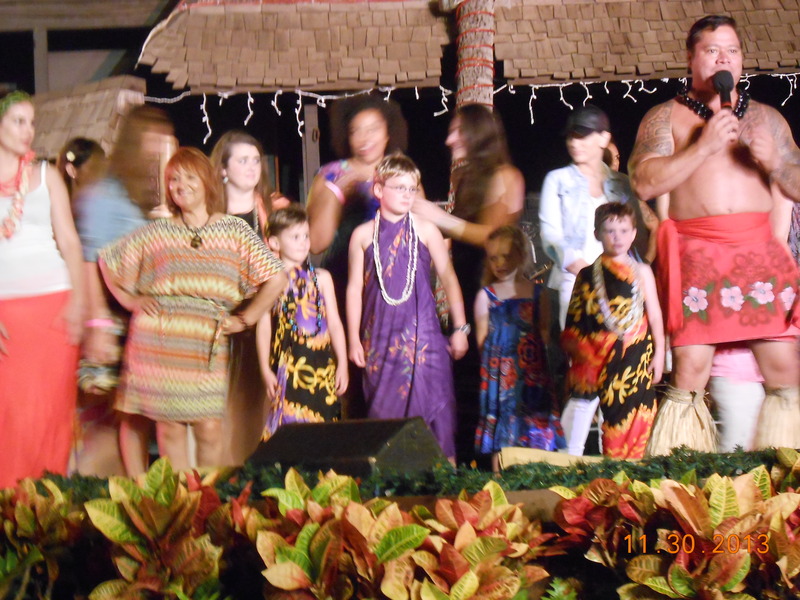 It was great with traditional Polynesian music and dance, as well as samples of earlier performances, including “Oh What a Night!” We thought the warrior dances from Hawaii, New Zealand, and Samoa were especially great. Unfortunately all good things must come to an end as we retired to our cabins to pack up for our departure the next morning. The hallways of the ship were already lined with luggage set outside to be transferred ashore when we arrived in Honolulu. 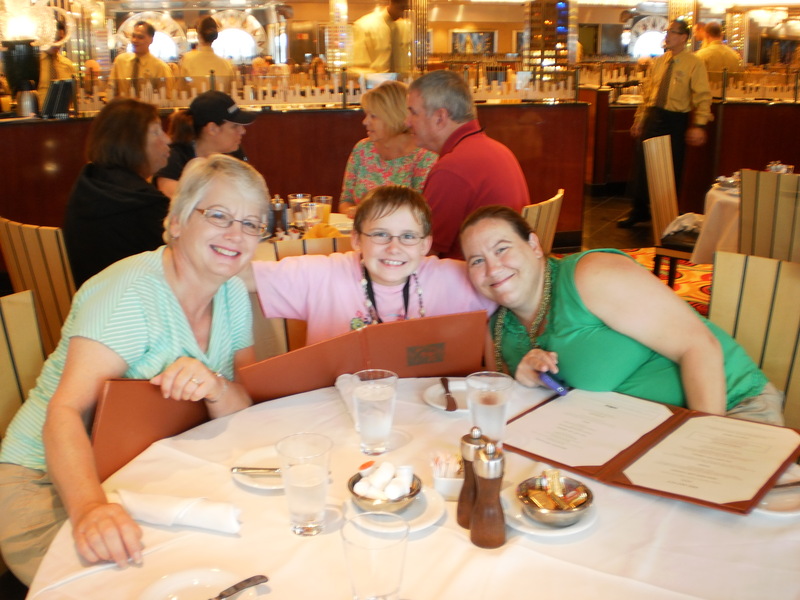 The next morning we took our time disembarking, and Elisabeth, Pat and I had a last breakfast in the Skyline Dining Room with Katrina. We are all so spoiled with this carefree lifestyle! Our last night in Hawaii was spent at Germaine’s Luau. Upon arrival, we were welcomed with a Hawaiian Shell Lei. The sounding of the conch shell announced the beginning of the evening’s festivities! The imu (underground oven) with Kalua Pua’a (roasted pig) – the main course of the evening was uncovered in ceremonial fashion. The night was filled with beauty, color, and excitement as Germaine’s multi-talented kane (men) and wahine (women) took us on a non-stop journey throughout the Islands of Tahiti, Samoa, New Zealand as well as the romantic hula of Hawaii. The girls enjoyed the chance to join the dancers on stage to participate in the hula. We all had a great time and it was a great way to conclude our trip to Hawaii. Our last day on Oahu was our only rainy day in the entire trip, talk about having good luck with the weather! 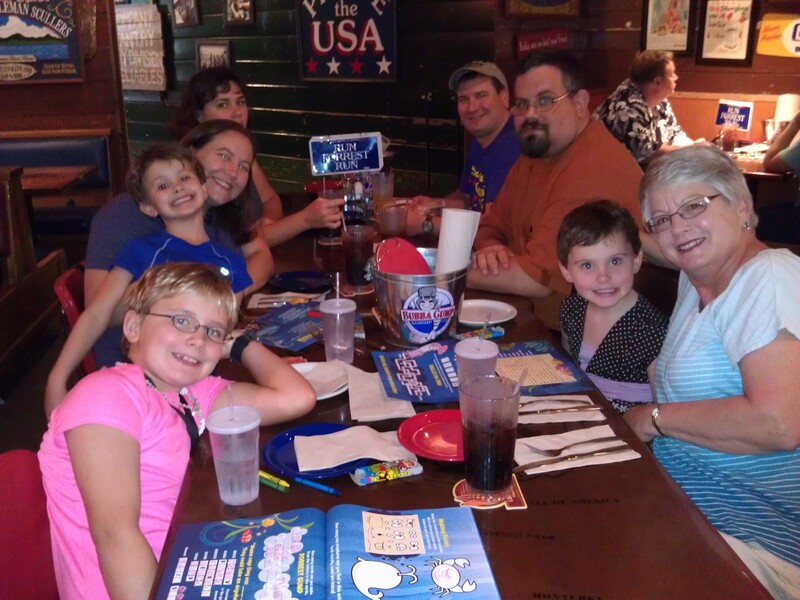 We had a final lunch together at Buppa Gump’s Shrimp Company, then headed for the airport. Pat and I traveled on the same flight with Scott’s family while Elisabeth and Dave traveled on their own. 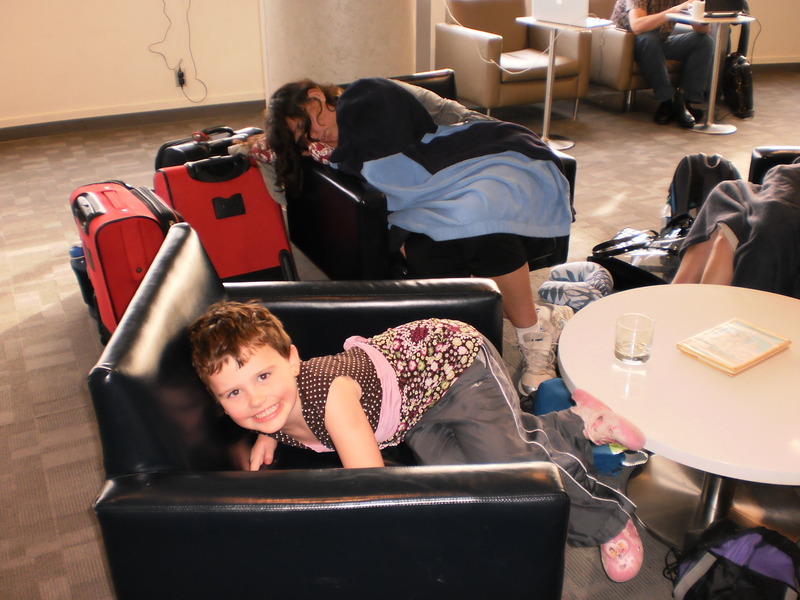 We took advantage of the Delta Sky Club in Los Angeles to rest while waiting for our connections. Sierra didn’t seem to need as much rest as the rest of her family! All in all, it was a great trip, one we will all remember for a long time – Aloha! 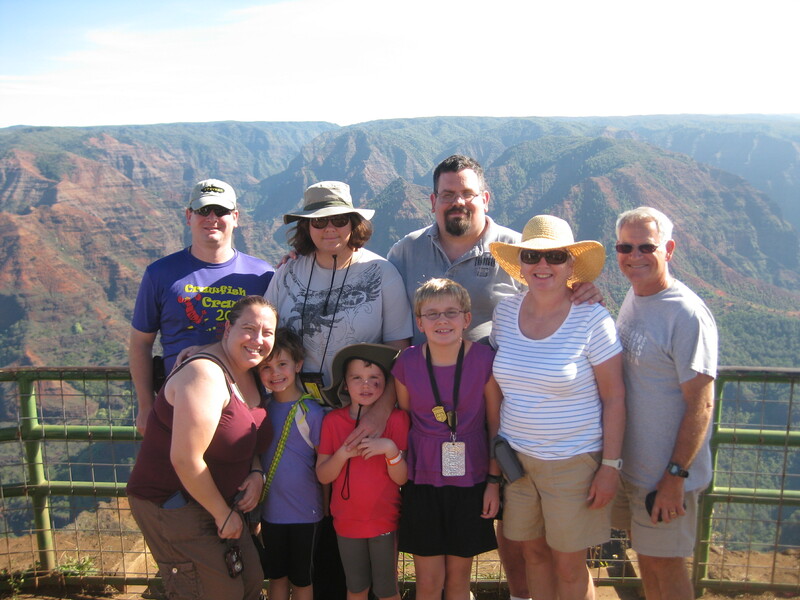 This entry was posted in Fulltime RV, Hawaii and tagged Diamond Head, full-time RV, fulltime RV, Germaine's Luau, Hale Koa, Haleakala, Hilo, Iao Valley, Kaui, Kilauea, Kona, Makena Landing, Maui, Na Pali Coast, Oahu, Pearl Harbor, Pride of America, RV Forums, SCUBA diving, Spouting Horn, USS Arizona, Volcanos National Park, Waimea Canyon. Bookmark the permalink. Thank you for a very fine, informative and entertaining synopsis of your Hawaiian Cruise. Jealous of sorts, but would love to duplicate your trip in the near future. How did you arrange for a vehicle at each of the ports, through the ship’s concierge? Love following your blog…. please keep it up. The Pride of America is with Norwegian Cruise Lines and I think they are the only cruise that originates in Hawaii. We rented the cars on our own, but the rental car companies meet the ship when it docks and shuttle you to pick up the car. The cruise line had no system for renting cars for their passengers. I liked reading about my and my grandparent’s journey. We are glad you enjoyed this post. 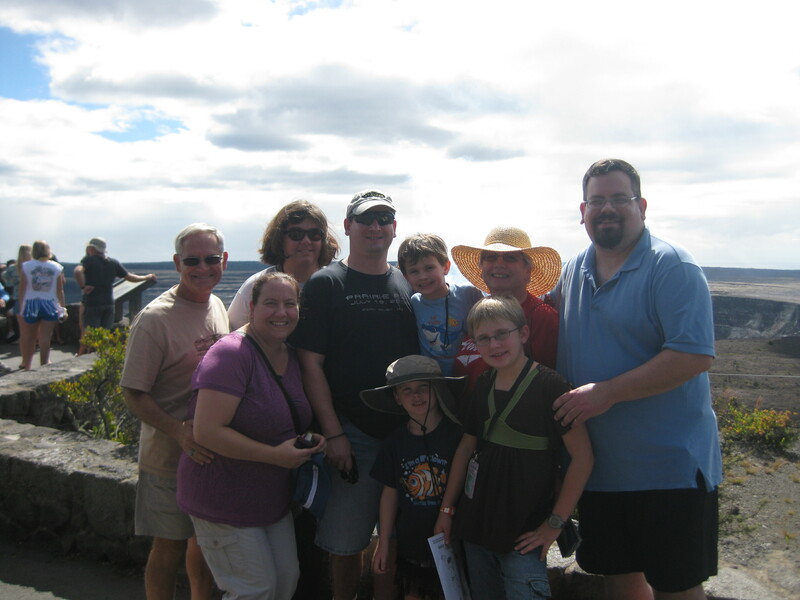 We enjoyed having you and your family with us on the trip.